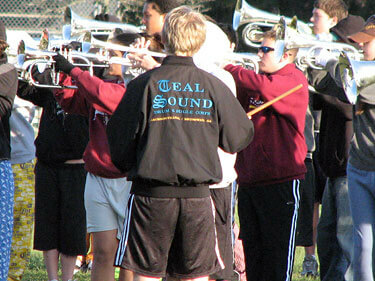 Submitted by Teal Sound: Teal Sound just completed its second rehearsal camp this past weekend in Jacksonville, Fla. The camp was a huge success with more than 58 brass, 37 percussion and 18 color guard members in attendance. The weekend turnout for the guard was the biggest surprise as since there were three winter guard shows taking place over the weekend throughout Florida which kept another 12 members from attending. The primary focus for the weekend was to rehearse the first four minutes of music with the brass and percussion. A continued focus on techniques was worked on as well. The visual program is well on track for the season as the visual staff was able to get in about six hours of marching techniques. This weekend was a great lead-in to the February rehearsal camp when four minutes of drill will be added to the program. The corps is right on target with the winter schedule due to the talent level of the members and staff with this year's group. Teal Sound took time to rehearse outside.